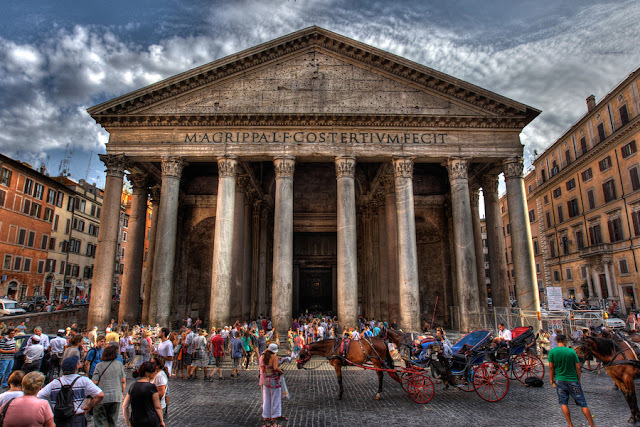 The Pantheon , an adjective meaning "temple consecrated to all gods" is a building in Rome, Italy, commissioned by Marcus Agrippa as a temple to all the gods of Ancient Rome, and rebuilt by Emperor Hadrian in about 126 AD. The building is circular with a portico of large granite Corinthian columns (eight in the first rank and two groups of four behind) under a pediment. A rectangular vestibule links the porch to the rotunda, which is under a coffered, concrete dome, with a central opening (oculus) to the sky. Almost two thousand years after it was built, the Pantheon's dome is still the world's largest unreinforced concrete dome. The height to the oculus and the diameter of the interior circle are the same, 43.3 metres (142 ft). It is one of the best-preserved of all Roman buildings. It has been in continuous use throughout its history, and since the 7th century, the Pantheon has been used as a Roman Catholic church dedicated to "St. Mary and the Martyrs" but informally known as "Santa Maria della Rotonda." The square in front of the Pantheon is called Piazza della Rotonda.